When conservative politicians talk about small government, they don't mean small and weak government. They mean small, strong government, where formal processes are replaced with personal relationships. Conservative politicians calling for small government actually want fascism. They maybe don't understand that, but it's what they want nonetheless. Hey, speaking of fascist economies, the Liberal Prime Minister of Canada recently fired our attorney general/expelled her from the Liberal Party because she refused to intervene in the criminal prosecution of a huge corporation. Typical neoliberal scandal. Of course, Liberal Party fans are contorting themselves to defend something that they'd've rioted in the streets over, had the other neoliberal party (Conservative Party) done it. What libertarians/delusional conservative folks don't understand is that there's no way the state can not interfere directly with the economy. Either the state controls corporations or the corporations control the state. The former is called socialism, the latter is called capitalism. An extreme form of the latter is called fascism, and if there's a middle ground, that's called China. I mean, private property itself has to be enforced by the state ffs. No state, no private property. To be fair, the "center" in politics today is probably a lot more to the right than it was some years ago. Not only that, the american """""left""""" (dems & co) would probably be considered center-right in some other countries. Not "probably", 100% absolutely. Remember this guy is the conservative opponent to FDR. This whole "nazis are left-wing" phenomenon is a direct result of that libertarian "left=more state=opression"/"right=less state=FREEDOM" bull**** that a lot of poorly informed people buy. Plus it just fits so well in the general american worldview that it's not surprising it's a thing. It's a bizarre and even less rational form of a red scare revival, where everything bad is left wing and therefore everything left wing is bad. Yeah, I've said on here before that American political terms are so unhelpful they actually worsen the discourse, and this all fits into that. Don't get me wrong, people still know where they stand, but they can't describe their beliefs for **** here. I can think of a few kleptocratic dictatorships where corporations are definitely not in charge, but it's also not socialism. Bill Clinton's triangulation was deregulation, balanced budgets, and small government. There's only two ways a dictatorship can maintain itself: either through genuine popular support (brainwashing won't do) or through large-scale economic support from financial elites, national or international. Of course, for the latter to happen, said dictatorship needs to be somewhat "friendly" to said elites. I actually don't like using the term "dictator" as it implies that one person alone is making all the decisions. That literally never happens. Last edited by SMLiberator; 04-04-2019 at 03:03 PM. I think that's the whole point: to keep people (like Wookie) perpetually trafficking in confused ideas like libertarianism just long enough for the oligarchy to fend off the latest round of threats to their profits. Then people can tell themselves there is always next election and find some scapegoat, but the "petrol-political" complex will always dump enough money on the electoral process to ensure that nothing changes. Their proxies ("conservatives") seem to do a lot of their dirty work for them, due to decades of successful cold war brainwashing and clinging to broken ideology (usually with some obsession over "cutlure war" issues as the linchpin). Of course in moments of clarity and self-reflection, even a conservative will be hard-pressed to accept alternatives to voting red, all because the two-party system makes actual political representation of viable, third party alternatives in elections all but impossible: you're either stuck with fascist candidates or broken "leftist" (not really) candidates. Last edited by Reverend Jones; 04-04-2019 at 03:08 PM. There's only two ways a dictatorship can maintain itself: either through genuine popular support (brainwashing won't do) or through large-scale economic support from financial elites, national or international. Governments (writ large) maintain themselves through violence, whether that means stealing from the elites or suppressing the working class so the elites can profit from them. A government doesn't need popular support or large-scale economic support, all it needs is the capacity to create and enforce a monopoly on violence. Popular support is certainly not sufficient to keep governments around (e.g. pre-revolution Iran, pre-****hole Afghanistan, *touches temples* Venezuela in 5 years). And support of financial elites is circular, since if an unpopular government guillotines all of the elites, whoever's put in management necessarily becomes financial elites. Guys I’m pretty worried about the state of American capitalism. If Jeff Bezos loses 25% of his wealth, what incentive will he have to create jobs? I think we’re in trouble here. This whole thing really speaks to the importance of marriage as an institution. Have you tried just letting Jeff Bezos commit crimes? If I know investors, they like good, safe countries with respect for the rule of law, and nothing screams respect like chauvinism based on a theory of ethnic bourgeoisie. I don't think it's accurate to say the Venezuelan government is keeping itself in power through violence (not that they have a monopoly on it) (I also don't think it's accurate to call Venezuela a dictatorship, but still). Foreign economic elites attempted to turn Venezuelan public opinion against Maduro and in favor of Guaidó, but seem to have failed miserably (much unlike what happened here in Brazil a couple of years ago (and pretty much for the entirety of the past century in Latin America as a whole)). If not for overall public support of Maduro (or at least against the coup), for what reason then does the attempted coup in Venezuela appear to have failed? I'm not commenting on particulars. All government power comes from violence, whether it's Venezuela or America or Canada or even Sweden. Even popular democracies need to use violence to enforce democratic choice, because not everybody will always agree with it. This isn't necessarily a pleasant way to think about government, but it's a frank one. The monopoly on violence doesn't mean other people never commit violence, it just means the government reserves the absolute and exclusive right to authorize violence. Violence is also special in some other ways. The prohibition on violence is positive; governments categorize violent acts not to enumerate the kinds that are illegal, but to enumerate the severity and special legal cases. It's like if... instead of a government prohibiting drugs, they instead list all of the things that are legal to eat, drink, and smoke, and anything else is illegal. Very few prohibitions work this way. Violence is also special because, while the government may reserve itself additional powers, the enforcement of those powers ultimately comes from the threat or commission of violence (e.g. the government sends you to jail if you don't pay your taxes). None of this is to call out Venezuela or any other government for being particularly violent. It's just a consequence of being a government. Last edited by Jon`C; 04-04-2019 at 05:07 PM. Oh, I guess Google hired the president of the Heritage Foundation to its AI ethics board. I know this because apparently 2000 Google employees signed a letter demanding her dismissal. For reference, she has no knowledge of technology, AI, or ethics (not as it relates to AI, to humans, to herself, or as a subject of philosophy). What she does have, however, is deep and lifelong connections to the Republican elite, something she is apparently happy to lend Google in exchange for a small sinecure. And ^ that ^, ladies and gentlemen, is what a fascist economy looks like. Hiring a useless appendage to make friends with the party of strongman nationalism? Yeah, it looks pretty bad. I guess this is more about getting her to talk Republican state legislatures into legalizing untested self driving AI on the road or something. Gotta get in favor with the ruling party. Tbh there's a bit more going on in a fascist economy than just cronyism tho. I heard an interesting take lately on the all-American trend to try and rebrand Nazism as a left-wing movement. Their idea was that it's not always a slander of the left, a cheap way to go "hur hur the left are the real nazis". There's also the desire to portray history as though there's no bad consequence for moving further to the right. It's an attack on centrism. Previously the argument for centrist views was, too far left you're a Soviet, too far right you're a Nazi. If all of the worst crimes are by the political left, it seems as though going further right has no bad consequences. Mapping politics to a single dimensional axis is only roughly useful for a small differences at a single point in time. Pushing it any further than that is absurd, and usually just a means of spinning an oversimplified and self-serving narrative. Here's an economics discussion: Let's say capitalism does what capitalism does, and in 25 years Amazon has a de-facto monopoly in retail and a large market share in pretty much every other industry. Not necessarily the biggest market share in every industry, but still the biggest conglomerate in human history. Certainly the largest entity in the United States after the government, but also firmly in control of the government because, y'know. Now, let's say you were suddenly put in charge of Amazon. Your shareholders are banging on your door every night, demanding even more growth, and even bigger returns. What would you do? I've been thinkin', at that scale you're almost more powerful than the fed. And this is a world where literally everybody not working for Amazon is a competitor, so in order to grow bigger your goal is to crush everybody other than Amazon. So this is what I'd do: I'd hike my own wages. At the scale I'm operating this would generate inflation, but it wouldn't cost me much because almost all of that money will get returned to me at inflated retail prices (along with my workers savings). Once inflation got high enough, investment stops being rational, so investors and business owners would start dumping assets that I could snap up for cheap. Then I can bring inflation back down to ~0%. Last edited by Jon`C; 04-05-2019 at 12:56 PM. Mapping politics to a single dimensional axis is only roughly useful for a small differences at a single point in time. Ehh, yes and no. It's true that left and right positions drift, but there's also strong similarities between the left and right between the ages. You're not seeing too many left-wing monarchist movements. I still think you can almost perfectly (in the sense of having only a couple asterisks) sort people into being left-wing or right-wing predominantly on whether they support social hierarchy. Being left-wing means you believe more strongly in equality and being right-wing means you believe more strongly in hierarchy. Everything else is contextualizing these core reflexes. Laissez-faire capitalism was a left-wing idea at inception, and I still consider it more of a liberal position than a right-wing position. It becomes right-wing only after you get Ayn Rand "I'd literally love to pleasure a billionaire" reconstruction of social darwinist views through the lens of economics. I mean, have you ever heard a conservative say "he didn't deserve the money he earned"? No, because they literally think your income is a perfect reflection of your rank in the social hierarchy. The formula is all there, it's just buried under a bunch of nonsense. People actually kinda committed to laissez-faire/neoliberal capitalism, like some moderate Republicans or Democrats like Clinton, generally publicly recognize that billionaires can be kind of ****ty, sometimes, or that sometimes inequalities are not the result of one's superiority. Not that we should do anything about it, to them, but at least they acknowledge that net worth isn't indicative of a person's value like some do. Pushing it any further than that is absurd, and usually just a means of spinning an oversimplified and self-serving narrative. Per the above, the American understanding of political words is ****ing horrible. The fact we equate conservative = small government laissez faire is a travesty. These people should be called "economic liberals", or people who believe primarily in equal economic treatment via the market. This is a liberal view. It's a primitive liberal view, but a liberal one. If you think taxes are awful nowadays, be glad you aren't a ****ing French serf in 1788 with literally unaccountable tax collectors in random province, indecipherable laws made by god knows who enforced god knows when by some guy you don't really know, or an artisan with massive tariffs everywhere to transport anything to another province. Also, you know, the literal entire rest of the world understands the terms this way, so we could maybe join them in defining things in a way most in accord with history, the reality of people's beliefs, etc? Last edited by Reid; 04-05-2019 at 04:51 PM. I guess understanding European intellectual history (which informs pretty much all of American intellectual history) is too un-American, though. Might as well use words wrong and get mad, despite nobody having a real sense of what anyone cares about in America anyway. I don't see it, why would dumping cash into assets not be a good thing during inflation? Because the opportunity cost of saving is consumption. Let me give you an example. Let's say you're a professional rich person. You live off capital gains. Specifically, capital gains from just stock and commodities speculation (the only kinds of savings that don't get directly obliterated by inflation). Your lifestyle costs, say, $15 million a year, which your family office generates by selling stock. Now, I'm Amazon. I do some economic engineering, and your cost of living goes up 15X this year. wyd? In the short-term, businesses DGAF about inflation, but stock markets are just markets. Prices are based on ability to pay and willingness to pay, nothing more. In the long term the stock market might find a new equilibrium that approximates the scrapyard value of a company's assets, but in the short term, you've got an awful lot of savers looking to sell and not a lot of buyers looking to buy. Other kinds of savings are progressively worse. Here's another trick you could pull as Amazon: Sell bonds. As much as you can, trillions upon trillions of dollars if you can manage it, at whatever interest rate it takes. Then spend it all, and drive inflation to the ****ing moon. Suddenly, you're not in debt anymore. Nothing, the price of my stock will adjust pretty quickly to reflect inflation. Since as you suggest, stocks are inflation resistant, and people want to be cash poor during inflation so demand for stock will rise. During inflation? People will look to buy! Yeah so basically if Amazon gets too large, it can de facto run monetary policy to manage its debt. That much makes sense. Stocks aren’t necessarily inflation resistant in the short term. The capital it represents ownership over is, but as a security it’s really just a piece of paper. You need people to actually PAY inflated prices in order to create that inflated price. That will happen eventually, but the plan doesn’t require inflation fixed high for any length of time. The idea is basically to starve rich people and pensioners into selling their stock faster. At that point it’s really just a mathematics exercise. Whole market liquidity is X, your lunch is Y.
Cake is the original social media. My birthday cake this year had more than 52,000 followers. If you want to have a sincere discussion about the need for policy around social media and communications infrastructure I’m totally on board for that, but we shouldn’t let it distract us from chortling at anti-regulation capital fundamentalists discovering that occasionally businesses don’t share their sado-populist social agendas. Occasionally being the operative word there, I take it. But yeah, as I think you inferred from my last post, it does seem that there's a difference between coercing the speech of a small business owner who sells cakes, and demanding that a media company not capriciously censor content, in that the latter provides media in which customers express their own speech. But was it in fact capricious in this case? I dunno, maybe? Maybe not? Suing seems like the right recourse though. let’s extend the sensible chuckle a bit, while we’re at it. The Republican Party doesn’t want ISPs to be considered common carriers. What does that mean? Basically it means that they want ISPs to be able to discriminate based on the content that they’re carrying. The Republicans are only doing this to give ISPs a business advantage they’ve been asking for, not to suppress political speech. Despite that intention, though, the same regulations that enable ISPs to block, deprioritize, and filter content would also authorize ISPs to censor political speech if they wished. So this is where it gets a bit silly. Maybe it’s good to regulate social media so they can’t de-platform political movements, but there are many other groups involved in communicating that political speech that have the power to intervene. You’ve got datacenters, tier-1 ISPs, CDN vendors, DNS operators, last-mile ISPs, and even, say..., a little cake and coffee shop with free wifi that happens to not make cakes for Republicans. And those are just the active agents. Did you know Seagate hard drives all run ARM Linux? NLP is getting pretty good, so I bet a sufficiently motivated hard drive manufacturer could write some firmware that automatically deletes conservative opinions. If they couldn’t do it, browser, OS, and router manufacturers certainly could. Not that they would, but there’s nothing preventing them from doing it. 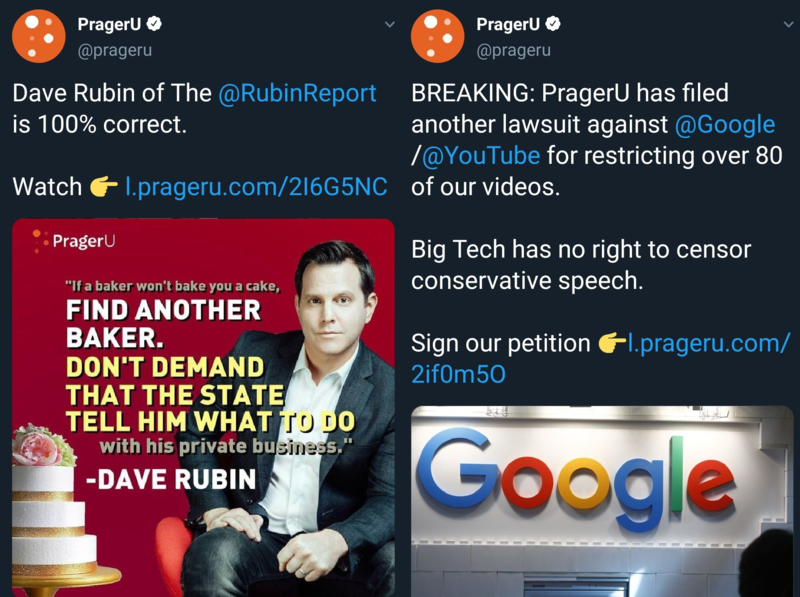 Obviously there has to be some reasonable line somewhere between forcing private individuals to make gay wedding cakes and prohibiting Google and Facebook from deplatforming right wing populists. I’m not sure what that line is, but considering how far up they’ve pushed that line its pretty obvious that Republican opinions are driven more by personal self interest than ideology. Regarding the difference between Google and a cake shop, though. Yes, they are different, but not in the way you’re probably imagining. IIRC US courts have ruled that websites are not public accommodations. A cake shop is. So the civil rights act would apply to a cake shop, but not to YouTube. Regardless of how you feel about each topic personally, the Google example is very good at showing why you can't make the simple argument: "it's privately owned, therefore nobody has any valid argument to what I can do with it". This is what many libertarian-leaning people argue, and yes many besides the people in question have been upset when a channel gets demonetized or something. There clearly is a point where being private doesn't matter, when your infrastructure is so ubiquitous it's basically public space. In other words these people should stop fronting cheap, stupid slogans and begin appreciating the nuance of the world. I think it's often to remind you of when you last looked. Sometimes I'll look up something on Amazon, decide not to buy it, then later it appears in ads. It's not meant to be a neutral ad, it's meant to remind me of when I searched and makes me think if I still want to purchase it. This is incorrect. When a conservative politician talks about small government they mean in reference to there intended scope. The scope of the federal government has grown far too large and should be made smaller while state and local governments should have their scope restored. What you described sounds more like the typical progressive Republican masquerading as a conservative. Having gained a greater understanding of your political positions and ideology I don't even think our ultimate goals are that different, just the method by which to get there. Just heard this story today, and I thought it was perfectly emblematic of what is going wrong with the world today. Weather forecasting in the US is done by the NOAA, not by private companies. Your local weatherman just reports NOAA data to you. It’s worse than that, actually, because your local weatherman isn’t allowed access to NOAA data. That’s restricted to a handful of politically connected aggregators like Accuweather, which take NOAA data and resell it without adding value. There’s no good reason why this data shouldn’t be made available to anybody who wants it. But companies like Accuweather lobby aggressively to get the US government out of the weather reporting business, and to restrict NOAA’s data to them and their cartel. Effectively, you (an American taxpayer) are paying for the NOAA to do their important and necessary work, and then paying Accuweather a rent for the privilege of accessing the data you paid for. Anyway, totally unrelated, but trumps unconfirmed undersecretary of commerce for oceans and atmosphere is Barry Lee Myers, CEO of Accuweather. Anyone who thinks "government is inefficient!!1!" without understanding any of the specifics of when that's true believes in propaganda. It's basically a highwayman telling you the local sheriff is corrupt when looting you alongside a bridge. Of course not, but we should go back to those times. Look, this isn’t even about overt, explicit corruption. Corporations and capitalism are widely popular in the United States. Would you really expect a government democratically elected under these conditions to be efficient? Americans have the government they asked for. I know this is technically going to be about gaming, but this seems more like the counter-culture thread, so I'm gonna post this here. Just in case anybody out there is scratching their heads, armed with the latest productivity research and Jim Sterling polemic, wondering why it seems like every game studio seems to prefer gross mismanagement instead of more efficient and competitive practices, I'd like to offer the following economics lesson: Horrible, soul-wrecking crunch is rational. It's not mismanagement. It's actually the optimal strategy for game studios. Look closer at that productivity research, and you'll note that productivity losses due to overwork accumulate over a long period of time. That's a big problem for,... well, I won't get into it, but for now just picture in your head what you think IBM was like in the 1960s. It's a big problem for that company. That engineering and management talent isn't easy to find, and even the mail boy took a bunch of training, so you have relatively high talent acquisition costs. Productivity losses from overwork are expensive. When you overwork one of those people you also need to pay to get them unwound. They're too expensive to throw away. Game studios are different, though. Everybody wants to be a game developer. People go to school for it. People intern for free at game studios just to get a foot in the door. So game studios don't have high talent acquisition costs, their costs are more or less zero. That changes the optimal strategy. Remember, productivity losses due to overwork accumulate over a long period of time; before those losses accumulate, overworking people actually does deliver higher productivity. That means the optimal strategy for game studios is to hire, overwork, and fire. Repeat forever. The best part is, you're not just maximizing your productivity. You're actually externalizing your organizational stresses. Those workers you fire are probably too burnt out to get another job for months after, but that's not your problem. That's your profit. So if you have some grand vision of entering the game industry and blowing away EA and Activision with your superior management techniques, ahaha. No. Crunch time is THE most correct possible management choice in the game industry. Your workers might be happier working for you than EA, but that'll be short-lived happiness because your competitors will ****ing destroy you. And that's why the only way to fix this problem is through regulation and unionization. Gamers, game developers, and software developers in general are a bunch of unusually libertarian bootlickery types, so it's been pretty cathartic to read public reactions to this stuff. The Epic Store stuff, too. For a bunch of libertarians they sure do seem to hate capitalism an awful lot. Last edited by Jon`C; 04-09-2019 at 02:53 PM. Yeah I noped out of every ambition to be a game developer after seeing how the industry treats workers. I'd rather be a school custodian treated with respect over a game dev worker. I've got bad news, because there aren't many jobs that have high talent acquisition costs anymore.